The School Council have been busy finding out how each class lives out our School Golden Values. Class 1 told us what they love about our school. They had lots to say! Congratulations to our newly elected School Council. Only meeting and showing Angela Rayner MP around our school! On Friday 12th October, the school council guided our MP Angela Rayner on a tour of the school and then submitted her to a Question and Answer session with tea and biscuits thrown in. The newly elected school council had prepared the tour around the school working in pairs. The tour included a very windy visit to the Secret Garden, outdoor areas, the school library, hall, infant area and FSU building and gardening area. The pupils explained key features of the areas they visited and Angela asked the children lots of questions. She learned about our Golden Values, the tremendous music provision in school, our links with Action Aid in Uganda, and all the beautiful work displays. No visit to the school could miss our pride and joy – the allotment and poly tunnels where we grow fruit, vegetables and flowers. Of course we had to tell her about our fantastic success in winning ‘Best Primary School’ at the Royal Tatton Garden Show this July! The children then sat with Angela in the staffroom and asked her lots of questions. The questions had come from all the different classes in school and ranged from topics such as her role as MP for Ashton, to her likes and dislikes as a child at school and her views on schools as shadow secretary for education. The visit was a great success. The school council had been very nervous and excited about their first job as school council members. They did an excellent job and this was in large part thanks to Angela Rayner who was wonderful - friendly, informative and she made them all feel very special and proud. We would like to give her a big ‘thank you’ for the visit and for making the children feel so special. She has made lots of friends at St James and we hope to welcome her back in the future. They even made time for heads, shoulders, knees and toes! Our super School Council have been very busy this year. Read their end of year report to read more about their year - including their fabulous trip to London. More roving reporter action for the Parish Magazine as The School Council record some of the fantastic events and tributes to mark the 100 year anniversary of 'Votes for Women' on International Women's Day. Followed by a jam packed newsletter to Dafeen who lives in Uganda and we sponsor through Action Aid. Dafeen loves to receive our letters and always write back to us to tell us about her family and school. Then, an article for the Parish Magazine to report on our visit from the Mayor of Tameside to award our Arts Awards. The School Council gathered class prayers to start the year and display on their notice board. Another exciting adventure for our School Council when they went to meet the new Mayor of Tameside, The Worshipful The Civic Mayor of Tameside Councillor Joyce Bowerman, at the Mayor's Parlour. Our Year 3-6 School Council representatives have enjoyed a fabulous trip to the Houses of Parliament in London with Mrs Walton (our Chair of Governors) and our headteacher Mrs Marsh. Whilst Mrs Marsh was looking through some old school photos, she found this picture of a St James' school trip to London sometime between 1930 and 1940. What an amazing picture taken in almost the exact same position as the one with our School Council. School Council made a busy start to the year by redesigning their notice board. The School Council really enjoyed visiting the then mayor, Councillor Vincent Ricci and his wife Julie. The mayor presented certificates in good work assembly and was taken on a tour of school by school council members before enjoying a cup of tea and biscuits with them! Our School Council visited the Civic Mayor of Tameside, Councillor Vincent Ricci, at Dukinfield Town Hall. Accompanied by our headteacher, Mrs Marsh, and our Chair of Governors, Mrs Walton, the children went prepared with questions to find out more about his important job. We were given a large map of the school and in small groups we created different trails. We then made the eggs, and we coloured them, cut them out and laminated them so that they wouldn’t rip. When each class came into the hall we all worked with different groups and helped them to get around the trail and find the answers to the clues. We searched for Easter eggs – it was great fun! At the end everyone got a chocolate. We had a lovely morning and we hope it runs again. It was the best day ever. We hope the next school council run a hunt! As a group we decided what we thought were the things we wanted to tell her about St James. We then chose sections to write about and once it was finished Amina collected all the work in and typed it up. We took a picture of the school council and some other school pictures were added to the letter as well. We are very proud of our letter. Click here to read our brilliant letter and take a tour of our school. We organised a school Golden Time disco – it was great! We asked lots of children what kind of music they would like and prepared our ‘disco list’ (Maddy: ‘With a bit of help from my Auntie!’). 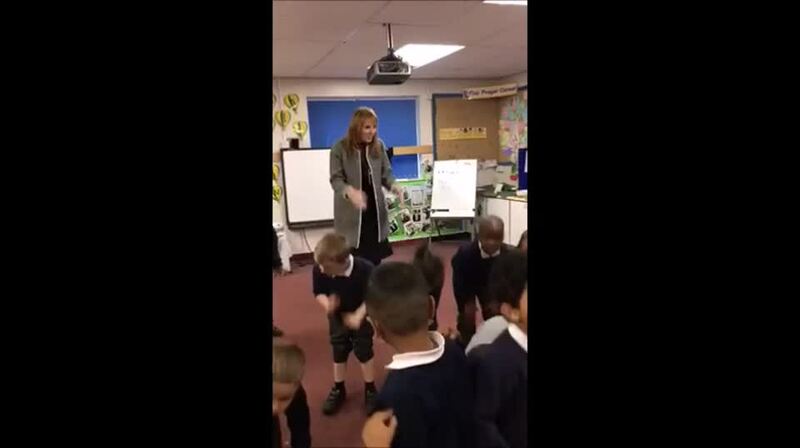 Then we invited class teachers to send some of their children to dance – and what amazing dance moves we saw! We organised a competition for a new school prayer. A box for entries was put in the entrance and we had 32 entries! The school council read them all and we decided that there wasn’t 1 winner. So we highlighted the sections of pupils’ prayers that we all liked and the prayer was created from that. The school prayer was read out in assembly and the names of the pupils who had helped to write it. It’s a lovely prayer that is special for our school. Click here to read our beautiful school prayer. We talked about this in our last meeting and talked about how we had been chosen. As a group we decided that anyone that wants to be in the school council should write a short speech/letter saying why they want be on the council and put it in a box in the entrance. We can then choose some pupils from these letters and check with the class teachers and then choose who will be on the council. What have I contributed to the school council this year?